Anne Tyler has had a weighty influence on American letters with her prolific collection of novels, which include the excellent Breathing Lessons, awarded the Pulitzer Prize in 1988, and her twentieth book, A Spool of Blue Thread, shortlisted for the Man Booker Prize in 2015. 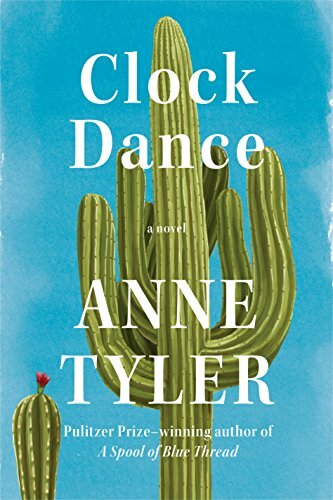 Her latest work, Clock Dance, showcases her easily approachable writing style but also some unfortunate weaknesses in her character development and narrative. Her story centers on Willa Drake, a woman whom the reader follows from her preteen years in 1967, early adulthood in 1977, married life in 1997, and latest chapter of life in 2017. The eleven-year-old Willa and her younger sister, Elaine, live in small-town Pennsylvania with their parents, the mild-mannered Melvin and dramatic Alice. Willa grows up wishing for a big, happy family because of the instability in her own small one. Her histrionic mother slams in and out of the house, fighting with her passive father, whom she derides as Saint Melvin. Alice is prone to Jekyll–and–Hyde mood swings, in which she changes from Willa’s bright, charming mother to a frustrated, erratic woman who hits her children and disappears unpredictably from the house, leaving a trail of emotional destruction in her wake. When her mother emerges after a two-day absence, the pre-teen Willa’s resentment at being placed in the position to care for her younger sister and suffer her mother’s bouts of temper pushes her to a critical decision: what kind of person she will choose to be in life. Her decision to emulate her father rather than her mother, as if there were only two choices available as role models, creates a profound effect on her own character and on her future. Tyler creates Willa as a woman like herself; one who chooses to be like her father, the submissive “steady one” in an adult relationship. From this choice the narrative progresses in a way that affects most action in the novel. Intelligent Willa’s meekness causes her to choose an opposing personality: a sharp-tempered, energetic husband who disrupts her career plans to choose an academic career in linguistics when she leaves school and gets pregnant. His ability to rescue her from her dysfunctional family pushes her to make this fateful decision. Willa’s responses are understandable in the context of her history, but they also make much of Clock Dance a mildly unpleasant read with little gained from the effort. Despite Tyler’s invitingly simple writing, the book drags on in the first half of the plot. Pleasant Willa lives a superficial life without much insight. She is not even able to understand why her now-adult sister might have chosen to wash her hands of her dysfunctional mother, father, and sister. At sixty-one, she gets a surprise call from her son’s ex-girlfriend’s neighbor in Baltimore, who believes Willa to be ex-girlfriend’s mother-in-law. Since Denise, the ex-girlfriend, has been shot in the leg, she asks Willa to take care of Denise’s young daughter, whom she believes to be Willa’s granddaughter. If all that seems exceedingly complex and improbable, that’s because it is. Tyler says that when Willa “rides through the city in a taxi, late one afternoon in the summer of 2017—well, to my mind, that’s when her story changes to Technicolor.” This change in Willa’s life comes too late in the narrative. The ensuing events, in which Willa takes a leap of faith and goes to Baltimore, Tyler’s home town, also seem unlikely. In the end, this is a novel about a woman’s choice, its effect on her future, and her desire for a colorful, loving family. The second half of the book reminds the reader of Maeve Binchy’s light, enjoyable novels in which extended and adopted families evolve and help each other. That being said, Willa’s childlike, timid approach not only in her earlier life but also in Baltimore make even that part frustrating as she slowly grows to understand what she wants. When Willa finally has her epiphany in the last pages of the book, Tyler leaves the reader to guess the decision she makes by leaving the novel open-ended. At that point, the reader no longer cares what she has chosen. Perhaps an older Anne Tyler fan might interpret and appreciate this novel and Willa’s problems differently. As a member of Generation X, I grew up in a context where marriage often took place in a woman’s late twenties and thirties. From early adulthood women have striven to fulfill an almost impossible goal of “having it all,” balancing a family and completely rewarding full-time work. They have also found it much easier to live an independent, satisfying single life than in the past. Women growing up in the 1950s and 1960s were offered a narrower set of options, which included finding a husband, bringing up a family, and potentially dropping out of school and giving up career possibilities. Some were very happy with this path. Many also found a different trajectory after raising children or reaching retirement. If Willa had realized her own needs and followed her goals for fulfillment much earlier in the novel, her character would have been exponentially more engaging. She lacks the inner conflict required to make her character provocative. In the end, I do not agree with the conclusion in Tyler’s preface to Clock Dance. The opportunities to choose a future self are not limited to once a lifetime, or even twice. To transform may be very difficult. Yet the possibility is always there for any of us to change our minds and potentially the circumstances that lead to happiness, self-knowledge, and contentment.